A highly accurate and powerful system for testing, measuring and calibrating built into a single compact portable instrument. The OMEGA™ CL427 indicator/simulator is a multifunction instrument designed to meet, in a modern and practical way, the needs of instrumentation engineers, both in laboratory and field work. Accurate, compact, rugged and easy to use, it is the ideal solution for measuring and simulating: millivolts, volts, milliamperes, frequency, sine, square and triangular waveforms, and thermocouples. The CL427 has been developed using the most advanced microprocessor technology to provide high accuracy on extended ranges and a powerful operating flexibility. A unique internal automatic RJ compensation system allows the CL427 to provide accurate input and output readings in operating conditions with a temperature range of 0 to 50°C (32 to 122°F). Further, external compensation is available that allows users to fine tune temperature output and measurement. The model CL427 has been designed for use in industrial environments such as factory floors, process plants, service departments and maintenance workshops. Millivolts, Volts, milliamps, and frequency can be measured or generated. Both accuracy performance and stability allow you to calibrate field and control room instrumentation. Square wave pulses can be generated with frequencies from 0.3 Hz to 20 kHz. Pulse height is adjustable between 100 mV and 20 Volts. 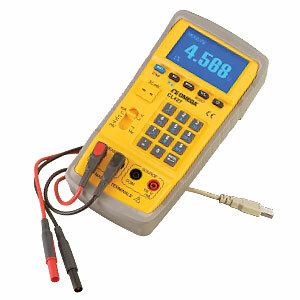 With this powerful function, the user can even test electro mechanical devices such as counters and relays. Simulating non-linearized temperature transmitters (Tx) allows the user to check and calibrate 4 to 20 mA system input hardware and software quickly and easily. User can set or manipulate temperatures in °C or °F related to any available sensor and send the appropriate milliamps to the system input. Milliamps can be monitored simultaneously on calibrator display. Nota: Comes complete with operator’s manual, carrying case, AC adaptor, certificate of calibration, USB cable, software CD, Type K thermocouple, alligator clips, test leads, and rechargeable lithium battery (11.1 V/1600 mAh).